I really enjoyed this project! I think my clay pieces turned out really well and would love to work with clay more often. My perfectionist side definetly came out while doing this project but I didn't have enough time to make every detail flawless. 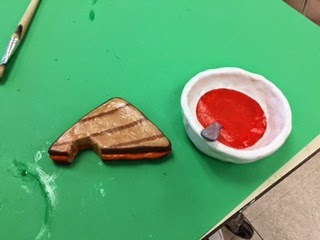 If I were to change something abut my pieces I would make the bowl smoother, put some support under to tomatoe soup so its shape doesn't blend into the bowl, and add more texture, value and color variations. Although I really like how the cheese in my grilled cheese turned out. Overall it was a fun project and i'm happy with the results.